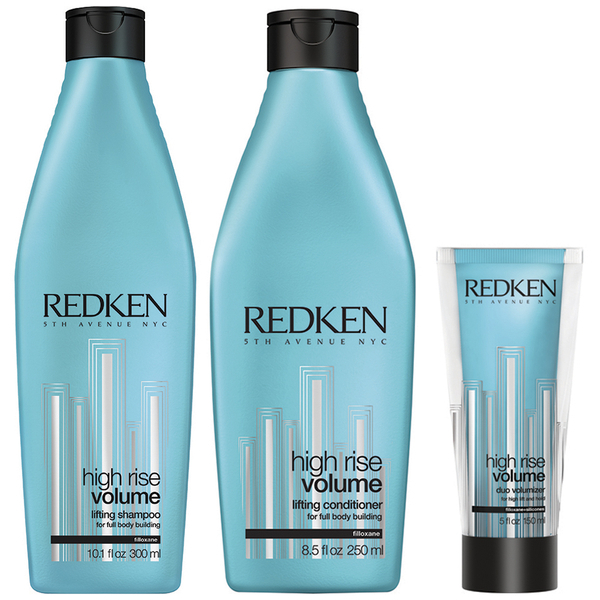 Boost hair's lift and body with Redken’s High Rise Volume Lifting Shampoo, Conditioner and Volumizer. Three products designed to work together as part of a regular hair care routine in order to volumize and leave hair with a silky finish. Redken's High Rise Volume Lifting Shampoo is a volumizing formula that works to cleanse whilst lifting fine, flat, lifeless hair. Infused with a blend of volume-boosting Filloxane and Silicone Polymers, the shampoo gently sloughs away dirt and grease whilst improving body, texture and visible fullness. Hair is left silky soft and manageable with mirror-like shine. 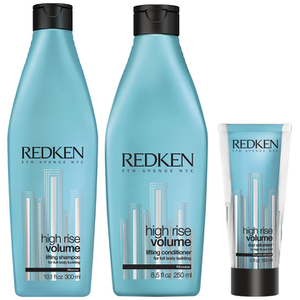 Redken's High Rise Volume Lifting Conditioner is a volumizing formula that works to lift fine, flat, lifeless hair. Infused with a blend of volume-boosting Filloxane and Silicone Polymers, the conditioner weightlessly detangles whilst improving body, texture and visible fullness. Hair is left silky soft and manageable with mirror-like shine. Enhance flat, lifeless hair with Redken's High Rise Volume Duo Volumizer, a 2-in-1 gel-cream treatment that works to add weightless volume and height to hair. The unique formula combines a volumizing hair cream with a high lift gel to promote fuller-looking, volumized hair. Its dose of body-boosting Filloxane ensures fine hair’s appearance is lifted and enhanced. Shampoo: Daily use on damp hair. Conditioner: Daily use after shampooing. Volumizer: Blend together and apply on damp hair. Comb through from root to tip. Blow-dry with a round brush for extra lift at the root.